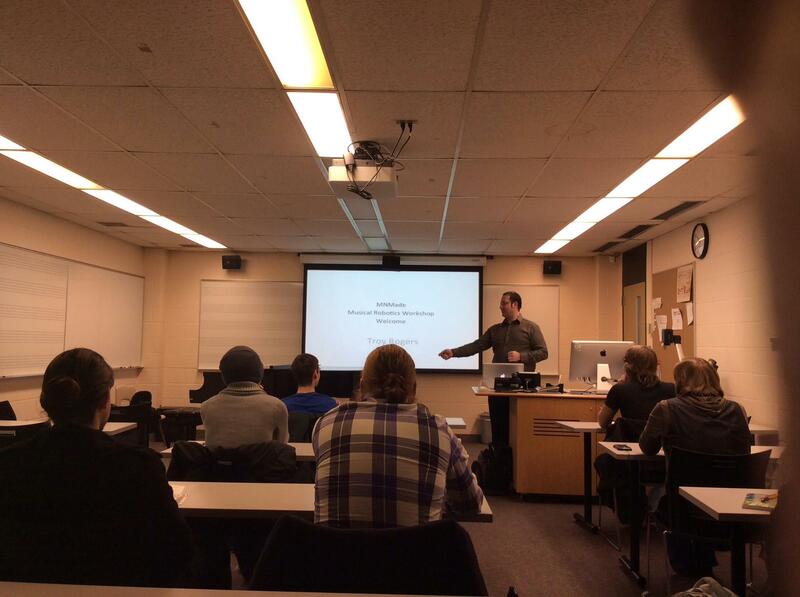 MN MADE 2014 centered around two guests: composer Troy Rogers, who lead Musical Robot workshops and presented a concert, and Zeitgeist, who led workshops and presented a concert of early electroacoustic music. MNMade is a festival celebrating, exploring, and disseminating the handmade and hands-on contemporary musical experience. The festival is especially interested in the practice as it exists in the state of Minnesota. In 2014, Troy Rogers gave an opening presentation on musical robotics and directed a multi-day workshop in which students created a new robotic percussion instrument and collaboratively composed new music for the device. The festival was capped off by a concert featuring robotic instruments with faculty and students (including the unveiling of the newly created percussion robot, which the students dubbed “ELMRBot” (Electrically Loud Musical Robot). I was honored to be a featured guest at the inaugural MN Made Festival at St. Cloud State University (my alma mater!) 2014, and excited for MN Made 2015 (more details coming soon). 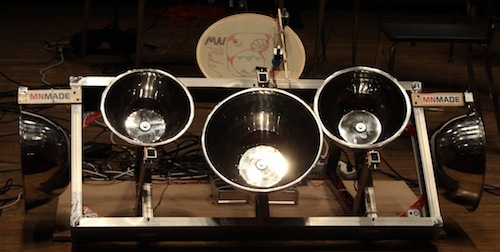 ELMRBot: a robotic percussion instrument created by students in Troy Rogers’ musical robotics workshop at MN Made 2014.